Sunday - B built retaining wall for pond in corner of backyard. Went to the gym where B played in his racquetball league, I worked out, boys hung out in the child center. Everyone spent a few hours in the pool. Had an early dinner at Pei Wei's. Trip to Lowe's to look at plants, wheelbarrows, statuary. Attended evening mass. Monday - Spent entire day working in the backyard. It was awesome that the 4 of us were all able to help prepare the corner garden. 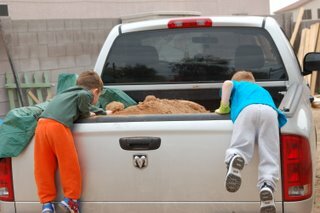 B moved 2 truckloads of dirt into the gardening areas. We're closer to being finished than ever before! See picture blog for progress pictures. Tuesday - early morning run to W*l-M*rt for grocery items and a pot for C's venus flytrap. Home for early lunch and a phone call from a friend to take her daughter to preschool since her newborn was feeling poorly. Picked up A, had to go to 2 gas stations to buy gas and ended up late to preschool at the D*sert B*tanical Gardens. Enjoyed a very busy class (15 students this session - twice as many as last!). Took A home, stopped at Spr*uts for produce, T*rget for incidentals, pick up B's shirts from cleaners. Called my brother about buying him a camera for his Ir*q deployment, found out he is getting married next week (!?!?!?!?!) Re-potted venus flytrap. Vented to B about brother's plans to marry. Called sis to let her know. Talked to Mom and vented more. Fed kids dinner. Talked to brother AGAIN and it didn't go well. Talked to Mom again. Made B call him and congratulate him, since apparently nobody else in my family felt up to it (including me). Spent tearful evening, ending with long bubble bath. Wednesday - Early morning doctor appointment for C. Got renewal prescription for Fl*vent, got a new prescription for Fl*nase in the hopes we can dry up his runny nose. Visited a local nursery and bought more plants. McD for early lunch. back home to IM convo with brother and finally coming to terms with his decision. (it's his life and his decision -- just because it seems sudden doesn't mean it isn't right). Clean kitchen, finally put away items purchased yesterday, update blog. Kmart to fill prescriptions and picked up new towels for rental condo. Bought wedding card for brother & intended. Bought brother a digital camera to take to Ir*q.
Thursday - Make beds and clean floors in rental condo in prep for Saturday arrival. (anybody looking for a condo to rent during vacation in AZ? Let me know!) Post office to mail brother's camera & wedding card and cord rosary. Much drama with family over brother's wedding next weekend, finally find solution that allows me to attend. Friday - Call Mom to find out how exploratory surgery went. Plant plants purchased a couple days ago -- realize I bought way too much groundcover. I'm still not sure what to do -- I could carve out another garden area, I suppose, or relocate some of the ground cover I already planted. Still thinking on this one. Go to post office for money order for B's sister and mail. Drop off bulletin notice at church for mom's group and drop off paper recycling. Stop at nursery and look for plants for 2 remaining clay pots. Laundry. Change sheets. Saturday Plans - Vaccuum, clean floors, general cleaning. SMALL grocery run.